Rice has long been at the top of the hierarchy in the prepper’s pantry. It’s inexpensive, a source of energy-boosting carbohydrates and can extend a humble serving of meat to turn it into a meal for a hungry family. But lately, it seems that rice is falling from favor – and there are a few very valid reasons for that. First of all, the pesticide load on conventionally grown rice is tremendous. PANNA (Pesticide Action Network of North America) identified more than 40 different pesticides on rice grown in California, with 15 of those pesticides on their “bad actors” list – which means that the pesticides have been proven in multiple studies to have negative effects on human beings and/or groundwater systems. The website Whats On My Food? noted that the pesticides included those which were known to be carcinogenic, bee toxins, human reproductive and developmental toxins, neurotoxins and suspected hormone disruptors. Rice that has been grown organically is not soaked in pesticides and fungicides from seed to package, like conventional rice. This is a vast improvement for the purity and nutritional value of a bulk rice purchase. White rice, when stored properly, has a far longer shelf life than brown rice, which is far more nutritious (and many find it much tastier as well). Unfortunately, though, even organic rice is not the best thing to serve on a regular basis. Recent studies have shown that all rice, organic and conventional, has a high level of naturally occurring arsenic. Arsenic is a metallic element that is toxic to multi-cellular life forms. There are two types of arsenic: inorganic and organic. Inorganic arsenic has not bonded with carbon, and is a known carcinogen. Organic arsenic is found in seafood and is generally considered to be non-toxic. It is excreted through urine within about 48 hours of consumption. Arsenic is taken into the rice from the soil, through the roots of the plant. Arsenic can get into the soil in many different ways, including the use of arsenic-containing pesticides. These pesticides can remain in the soil for up to 45 years after they were sprayed. Another source of arsenic in the soil is fertilizer made from chicken droppings – commercial chicken feed has been found to have high levels of the toxin. When rice fields are deliberately flooded, the water soluble arsenic in the soil is delivered to the roots of the plants. Brown rice contains more arsenic than white rice – the arsenic accumulates in the hull, which is stripped during processing. The hull, however, contains most of the nutrients in the rice. Consumer Reports independently tested a large number of rice products on supermarket shelves, with some very alarming results (you can see the chart documenting the arsenic levels of popular items like 365 brown rice, Great Value rice, Uncle Ben’s enriched parboiled, Gerber baby cereal, Kellogg’s Rice Krispies, Quaker rice cakes and many more. 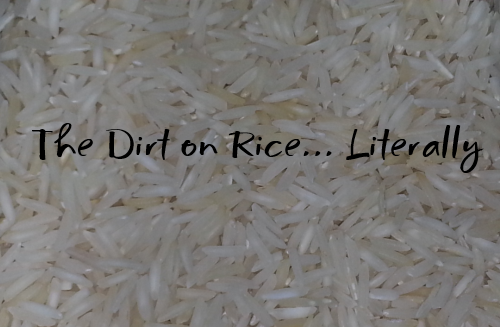 · White rice grown in Arkansas, Louisiana, Missouri, and Texas, which account for 76 percent of domestic rice, generally had higher levels of total arsenic and inorganic arsenic in our tests than rice samples from elsewhere. · Within any single brand of rice we tested, the average total and inorganic arsenic levels were always higher for brown rice than for white. · People who ate rice had arsenic levels that were 44 percent greater than those who had not, according to our analysis of federal health data. And certain ethnic groups were more highly affected, including Mexicans, other Hispanics, and a broad category that includes Asians. · Reducing arsenic in food is feasible. We examined the efforts of two food companies, including Nature’s One, trying to tackle the problem and learned about methods being used to try to reduce arsenic in products. · Based on these findings, our experts are asking the Food and Drug Administration to set limits for arsenic in rice products and fruit juices as a starting point. The arsenic cannot be completely removed from the rice through washing or cooking methods – it’s there, inherent in the grain. It can be reduced. 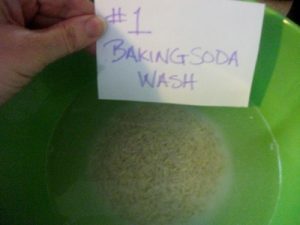 though, by up to 30% by washing the rice thoroughly before cooking it. The Asian cooking method of 1 part rice to 6 parts water, draining well before serving, as opposed to allowing your rice to absorb all the cooking liquid in the North American manner of cooking rice, is also helpful in reducing the presence of arsenic. These two steps also help to remove pesticides and antifungals that have been sprayed on the rice, as well as additives like talc and cornstarch which are sometimes added at the packaging plant in order for rice to have the clean white appearance we are so familiar with. Proper washing and cooking methods can significantly reduce the amount of toxins in home-prepared rice. I performed a little rice washing experiment this morning because I was curious whether I could get any visible results. I used the same method as I always do for prepping rice. I used a conventionally grown brown rice for this. I don’t have a lab, so I can’t tell you exactly what I removed from the rice – but the visual tells me I do NOT want to skip this – ever! I first soaked the rice in a baking soda rinse – 4 tbsp of baking soda to 2 cups of water. Then I drained the rice into a white bowl to make it easier to see what came off in the soak. I ended up with a dirty, dingy looking water with little flecks of dirt in it. I then washed out the bowl and dried it. 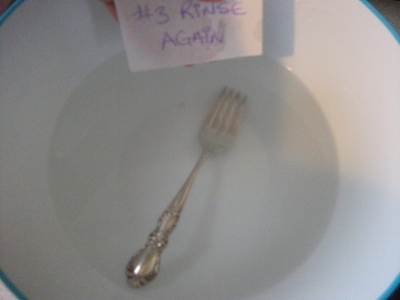 I rinsed the rice into the bowl – this time I put a fork in the bottom of the bowl to illustrate how cloudy and dirty the rinse water was. Again, I washed and dried the bowl and placed the spoon in the bottom. After the 3rd rinse you could start to see the fork a little better. I washed and dried the bowl and fork yet again. 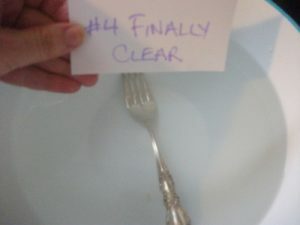 By the time I rinsed it a 4th time, the water looked clean and clear. 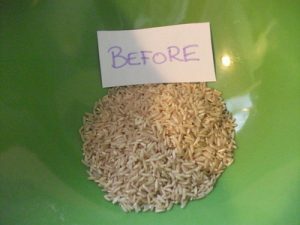 My personal rules for rice have changed after doing the research for this article. 1.) I won’t buy commercial products made from rice, because I don’t know the process that has been used to clean the rice and remove pesticides, dirt and arsenic from it. This goes for organic as well as conventional rice products. 2.) Rice consumption will be limited to once per week, if that, in our household. 3.) I won’t ever eat rice at a restaurant again! I’ve seen how they dump rice right from the box into the pot. 4.) I’ll only buy organic rice because of the outrageous amount of pesticide usage. In a prepping scenario, if your water is limited, rice is going to be the last thing you want to prepare because of the extensive washing and cooking water required. You don’t want to rely long-term on a food that contains something as toxic and carcinogenic as arsenic – the poison can build up in your system and cause serious problems. Look to other grains for your carbohydrates – consider quinoa, wheat berries, couscous, barley and oats – none of these grains has the extensive pesticide load of rice and the natural arsenic levels are far lower. Scary stuff. Rice was one of the first things I stocked up when I began to prep, so to hear the amount of bad things in it hits home for me. I’ve never rinsed my rice, but I will start to now. I’ve got three bags of rice that are five pounds each, if I manage to get through those, I’ll make sure to buy only organic to reduce the risk. I would think that the majority of foods produced at home, maybe even more so if abroad, would have nasty stuff in them; all the more reason to grow a bigger garden. Thank you for getting this information out there. Hi Pierce, I was disturbed when I found out about this as well. But it does not mean give up on rice, we still have rice on the menu quite frequently. 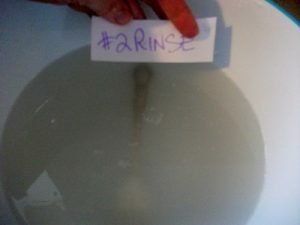 It just means rinse well and I now rinse multiple times as shown instead of not rinsing at all. I am sure eating home cooked meals is still a lot healthier than eating processed or junk food. Thanks for the comment. In a disaster situation, where are you going to get all the water to rinse your rice? Hi Mareena, it would be an extra challenge in a disaster situation, I think at that point there would be a lot worse things to worry about. Also recommend storing 1 gallon per person per day for the number of days you think you need, that would include water needed for cooking. Thanks for the comment. Honestly, in a disaster situation I’m a little more concerned with people not starving than what may affect them ten years down the road. But it would be a good idea to store extra water for cooking, the dirty rice water could be used to flush toilets in the event that plumbing is down in a short term disaster. Hi, I stumbled over your site by chance and have just been browsing. 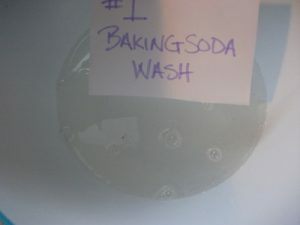 I just wanted to mention that the main reason the rinse water goes cloudy is due to dust and excess starch. Rinsing the rice makes it lighter and fluffier, and reduces the foam that amylopectin (a harmless starch) gives to the boil water. It may reduce arsenic levels as well, but that’s not what you’re seeing.